It’s official – Zero Balancing is very good for you! Over the last year, the Zero Balancing community came together to fund research into the health benefits of ZB treatments. Piloted by the Neuro Synchrony institute, the objective of this study was to understand what happens on both physiological and psychological levels during of the course a 30-minute ZB treatment. During the study, 30 ZB treatments were given from 7 different practitioners, with both client and practitioner hooked up to equipment that could observe and gather a wide range of information: EDA skin conductivity, body temperature, oxygen/pulse rate and heart rate variability. EEG sensors were used to monitor brainwave activity during 2 trial treatments. Volunteers were also asked to complete a scale Wellbeing questionnaire assessing their perception of changes in their emotional state before and after each ZB session. 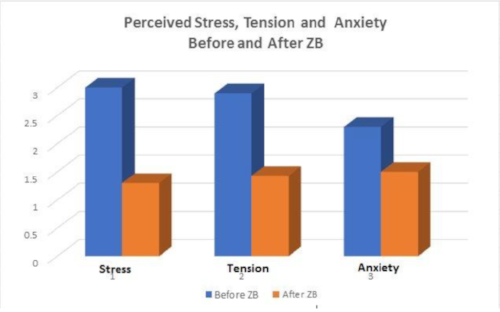 After all the data had been gathered and analyzed, the study results show ZB Touch facilitates the release of 61% of deeply held stress in a person. Not only did the EDA data evidence an average reduction of measured stress of 61% across the entire study, it also showed clients settling into a synchrony – or an equilibrium – with themselves at a point of “zero balance” on the EDA graph. In addition, pre/post questionnaire results showed that after every ZB session every participant rated themselves more positively. In conclusion, ZB Touch facilitates the release of 61% of deeply held stress in a person, and in so doing invites their mind-body-spirit to find a new equilibrium in this new environment. This new reduced stress state not only supports physiology and wellness at a physiological level, this new mind-body-spirit equilibrium importantly provides an easier environment for positive changes to lifestyle and behaviour to occur.